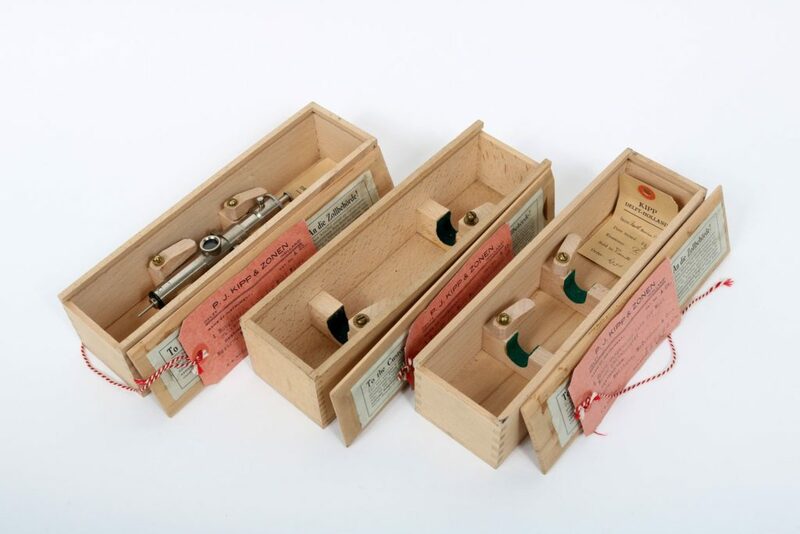 This object includes three identical boxes for a suspension tube for a Moll Micro galvanometer, one of which still contains the suspension tube (67.1). 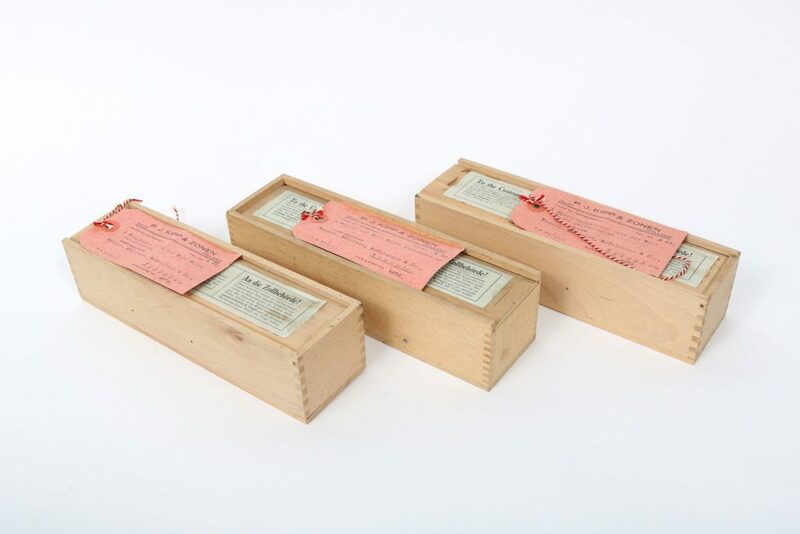 The boxes are rectangular wooden boxes made of a light wood. Each one has a lid that slides open longways. There is a pale green label stuck to the top of each of the boxes that contains information for customs officers, and a pink tag with a red and white string attachment (these are no longer attached, but simply laid on the top of the boxes). Inside each box, there are wooden supports lined with green felt. 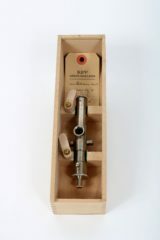 Two wooden pieces can be screwed down to hold the suspension tube in place. In 13.1, the suspension tube is still in place, although the screws have been loosened to allow the tube’s removal. 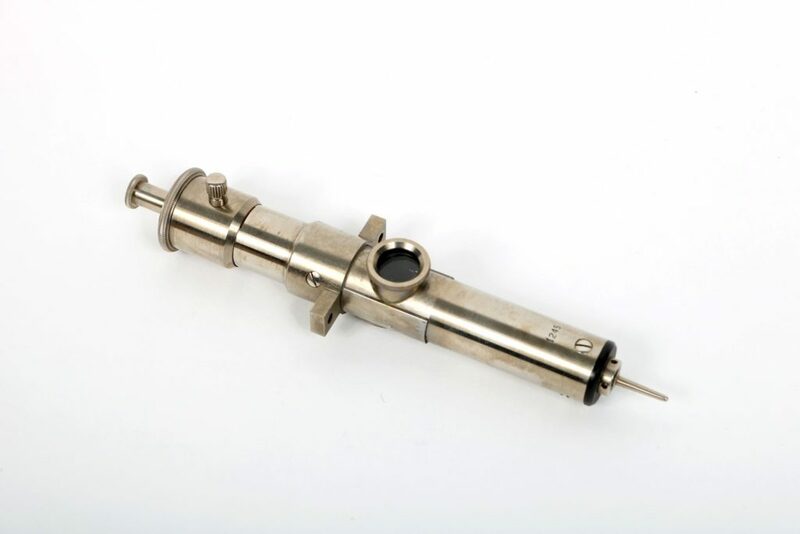 The suspension tube consists of a metal cylinder 14cm long. At each end there are narrower points, one of which ends in a knurled knob, the other to a rounded point. Various other metal pieces stick out from the cylinder. In the centre of the cylinder there is a circular glass window. Inside the window, a small circular mirror is visible. Also in the box there is a tan tag with inspection information on it. DESTINED FOR: Mssrs. Matthew, McCutcheon & Co. 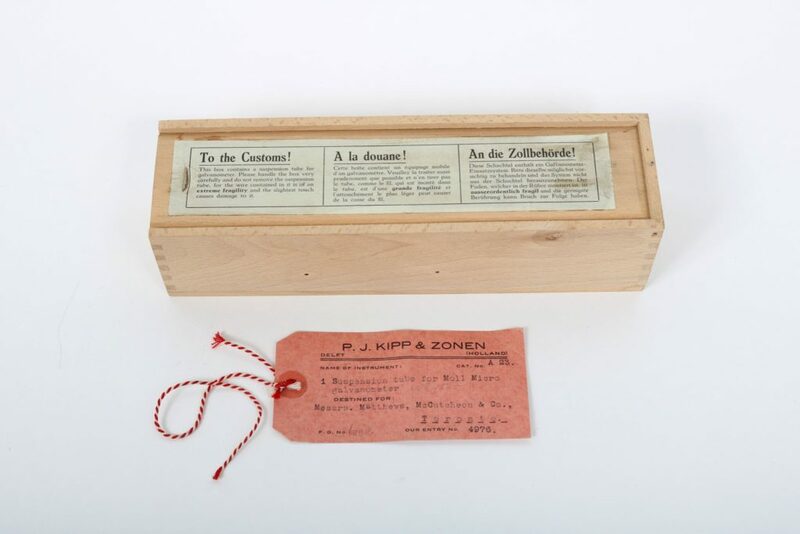 In English: “This box contains a suspension tube for galvanometer. Please handle the box very carefully and do note remove the suspension tube, for the wire contained in it is of an extreme fragility and the slightest touch causes damage to it.” (This information is repeated in French and German). 67.1: On the barrel of the suspension tube: “1245”. Dimensions (cm): Length: 24, Width: 6.6, Height: 5.8. 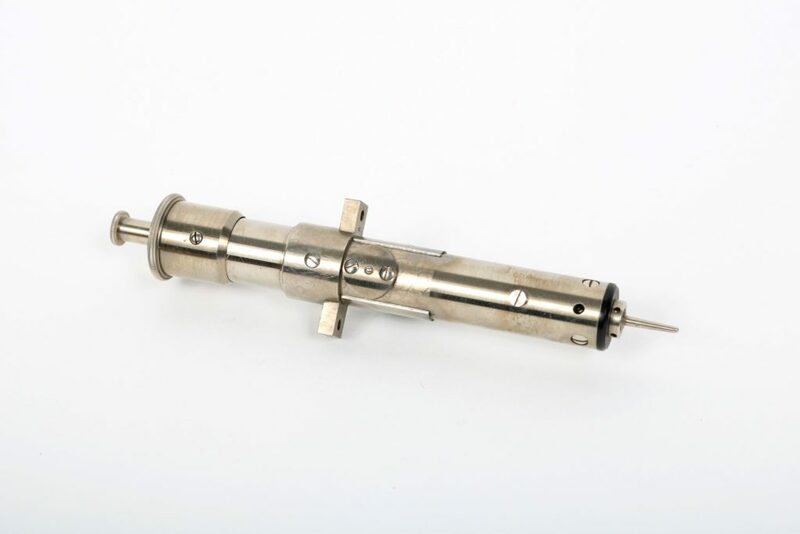 This is a piece of a Moll Micro galvanometer –a type of mirror galvanometer– used for measuring very small changes in electrical current. Light is reflected on the small mirror in the interior. This mirror is connected to a fine wire which is affected by tiny shifts in electrical current. The amount of the deflection of the mirror can be used to measure electrical current. 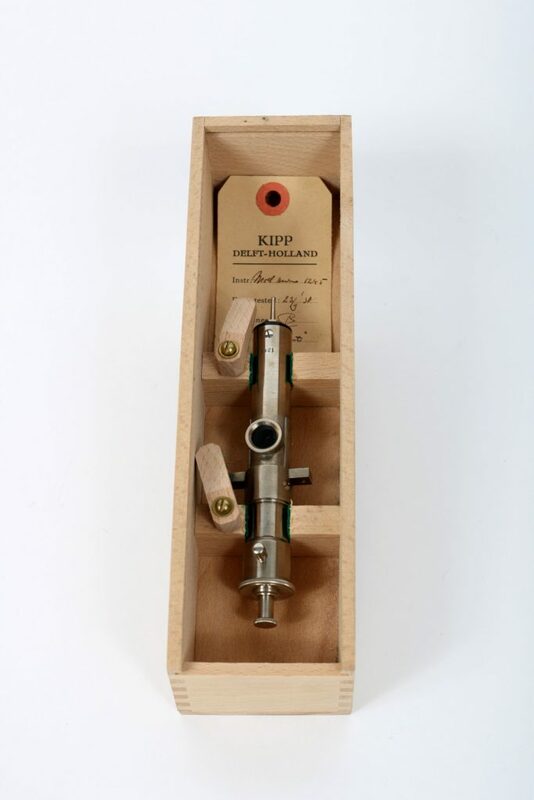 This object was possibly purchased for use with the Moll recording microphotometer, “for investigation of photographed spectra” similar to this one: (“Moll recording microphotometer”, Journal of Scientific Instruments, Vol. 12, No. 12, (1929) pgs 392-394: 392). Excellent: All three boxes are in near-new condition. 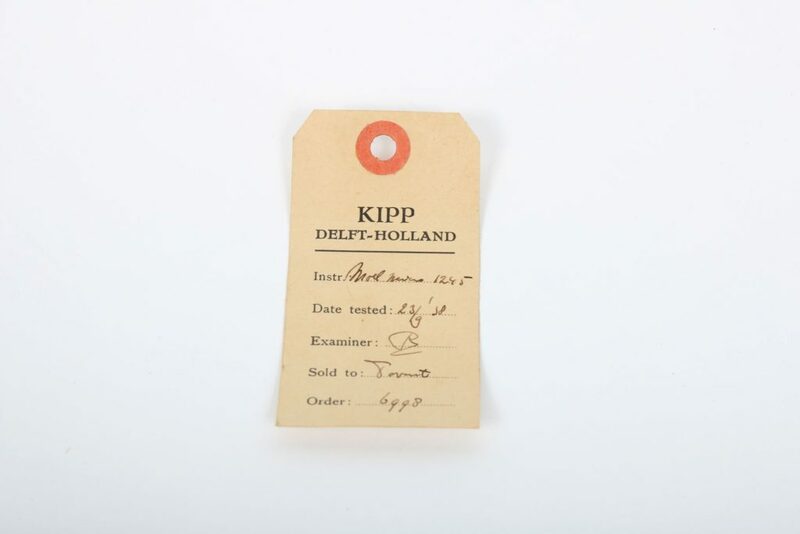 The labels are slightly stained and marked in places, and the tags are slightly bent. The suspension tube is in excellent condition, showing no signs of use. This object was likely moved from the David Dunlap Observatory in Richmond Hill in 2008, upon the sale of the observatory. It was stored at the Department of Astronomy and Astrophysics until 2017 when it was moved to a new storage location in McLennan Physical Laboratories. 1929 Journal of Scientific Instruments article on the Moll recording microphotometer, which included the Moll Micro galvanometer as a component.